The Vault is Slate‘s history blog. Like us on Facebook, follow us on Twitter @slatevault, and find us on Tumblr. Find out more about what this space is all about here. 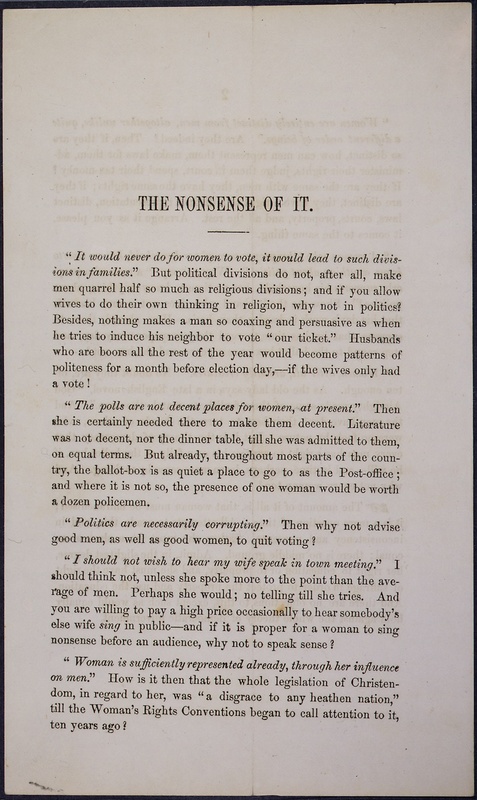 This pamphlet, entered in the Records of the House of Representatives in 1866, runs through often-heard objections to women’s suffrage, striking down each. The document lets us see which anti-suffrage arguments were commonly advanced, 18 years after activists at the Seneca Falls Convention first asked for the franchise. According to the author of the pamphlet, people arguing against suffrage would say that women were too precious to be risked at polling stations or corrupted by politics. Opponents tended to fret over the effects of suffrage on the household, or argue that women were too silly or too different from men to vote. There’s quite a bit of humor in the pamphlet, as the author pokes fun at men who bloviate in town meeting and complain to their wives of the difficulty of their work. Despite their foolishness, “every man has a right to express his own folly at the ballot-box, if he will,” the author writes. “Why not every woman too?” The very foundations of democracy depended upon it. In 1882, Higginson published a better-developed version of these arguments in a book, Common Sense About Women, which is dedicated to his daughter Margaret. You can read it on the Internet Archive.